With iPad app frenzy in full force, the App Store is growing by the minute as iPad apps are being approved. Early this morning, Mobile ad exchange Mobclix tallied the number of apps and the breakdown between paid and free apps in the store. According to Mobclix, there are a total of 3,122 iPad apps in the store (keep in mind, these numbers could have changed slightly in the past few hours). 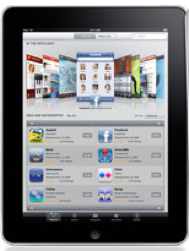 As of Thursday evening, there were 2300 iPad apps available for download. Currently, 80 percent of iPad apps in the store are paid apps, coming in at 2523 apps total. Only 599 of the apps are free, representing 20 percent of all apps. In terms of overall app numbers, games still rule; 942 of the 3,000 plus apps are games, with 804 of these apps being paid apps and 138 being free. Unsurprisingly, most of the 154 book apps available for the iPad are paid apps. Mobclix says the average price of apps is $4.99; and it will run you $12,572.78 to buy all the apps in the store. While iPad apps may not be easy on your wallet, Apple’s iPhone app store’s breakdown of free vs. paid apps are similar. As of mid-February, when the App Store included 150,000 plus iPhone apps, 75 percent were paid applications. Of course, the actual prices of paid apps should go down, if iPad apps follow the same trends as paid iPhone apps. And perhaps companies will ditch their pricey app strategy if users tend not to buy pricey paid apps. Time Magazine’s iPad app costs $4.99 per issue with the Wall Street Journal’s iPad subscription coming in at $17.29 per month.